Donors to CPSH understand and appreciate the importance of the work done at CPSH. If you didn't have a chance to donate yesterday, would you please donate today? Go to txcpsh.org/give2cpsh. Thank you! Special thanks to National Mortgage Insurance and Anonymous Donors for their matching donation challenges. New donors who donate $25 or more to CPSH will be matched $1-to-$1 by Nation MI up to a total $3000. Returning donors who donate $100 or more up will be matched $1-to-$1 by Anonymous Donors up to $2000 in total. Thursday, September 14, 2017 6am -12midnight. 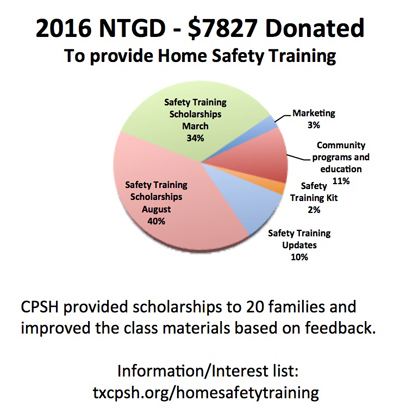 CPSH has chosen to North Texas Giving Day as our biggest community fundraiser of each year. Aligning with NTGD allows us to decrease our fundraising expenses by being part of the Community Foundation of Texas' branding and donation collection system.